Clear Pending Traffic challans Fine on vehicles @ 50% discount at Hyderabad LB Nagar Court Lok Adalat and Goshamahal Ground. 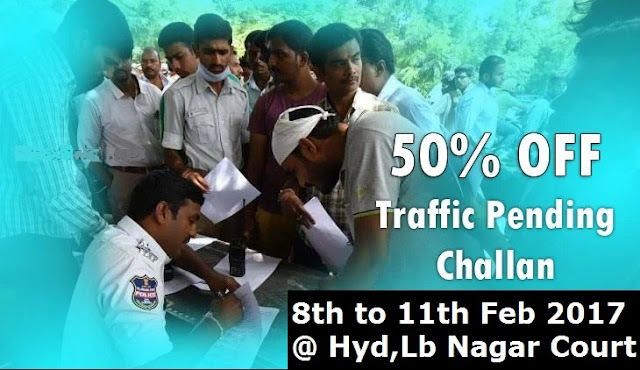 The Hyderabad traffic police, with the help of the judiciary, will be conducting a four-day Lok Adalat at Hyderabad LB Nagar Court from February 8th 2017 to February 11th 2017 where defaulters can pay 50% of their pending vehicle challan amounts and get the rest 50% waived. There are approximately Rs 100-crore worth of pending challans. Those who were booked for drunken driving can avail of the Lok Adalat too, provided their blood alcohol levels were below 100. Hyderabad traffic police said several motorists booked for drunk driving had abandoned their vehicles and skipped paying the fines. Courts generally give jail sentences if the BAC (Blood Alcohol Content) count is more than 100. So people with less than 100 BAC (Blood Alcohol Content) can avail the Lok Adalat, pay the challan amount and take back their vehicles too. Defaulters can approach LB Nagar Court and Goshamahal Ground from Wednesday to fill up the Lok Adalat forms. However, those paying online will not get the 50 per cent waiver. Hyderabad Traffic Police added that those who failed to pay during the Lok Adalat would face serious consequences in forthcoming special drives and their vehicles would be seized. It is an opportunity for motorists to pay all pending challans. LB Nagar magistrate will be offering their services at the Lok Adalat. Motorists can avail the facility from 10.30 am to 5.30 pm. If you have any queries post those in the comment box below. We will respond as soon as possible.